To be honest, there aren&apos;t many frozen indulgent foods that would get this writer to leave her cozy apartment in the wintertime to travel 20 miles north up the 2 freeway to Montrose. Yet the small community town, nestled in the foothills of the Angeles National Mountains, happens to be home to a new Danish ice cream export that just may have expanded that threshold of what it means to trek for food. Paradis opened up its first US storefront in September, boasting "ice cream made with the freshest ingredients that&apos;s only about ten minutes old when it reaches the counter". Mouth watering flavors like mint/lime sorbet, tiramisu, and banana chocolate had forced this former resident of Italy to question her loyalty to gelato, so we pretty much had to catch up with the owners behind Paradis to find out a bit more about their delicious ice cream. Thanks for talking with us! Let&apos;s start with a little history about the store. The store opened on Sept 26th 2009. We are 2 owners, both Danish, Morten Thorup and Mia Pedersen (myself). What makes Paradis stand out amongst other sweet treats, especially the current frozen yogurt craze? our ice cream on site every morning. We use only the best and highest quality ingredients available, and always fresh fruit. 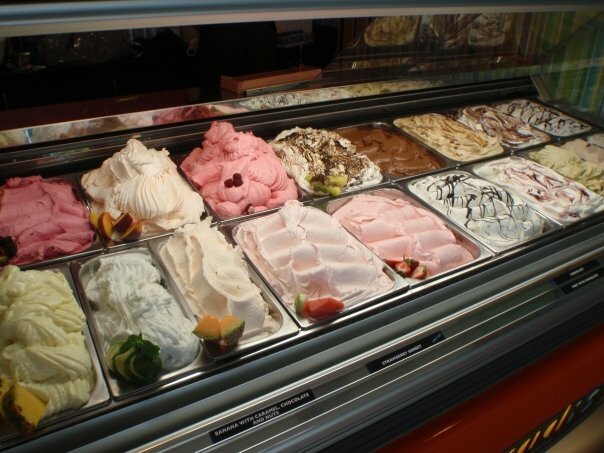 Our ice cream is made with milk, and our sorbets with water. It&apos;s lower in fat than regular ice cream and gelato. We use raw organic sugar and our other dry ingredients are imported from all different countries. For example, our vanilla comes from Madagascar, our organic dark chocolate from Germany, our pistachios from Sicily. None of our ingredients are random, everything is carefully chosen, to get the absolute best and natural flavor. Aside from the presence in Denmark, what made you choose L.A. as the first foreign market? The owner had no plans on taking the concept to the US, but we fell in love with California when we were here on a trip last summer. We were at that time BIG fans of Paradis in Denmark and our dream became to bring the ice cream we loved to the place we loved. So we contacted them and after many meetings bought the franchise and the rights to all of southern California. Tell us a little bit about the owner, we hear he has quite an interesting story. There are actually 2 owners of Paradis Denmark. Thor Thoroe and Joergen Bjerre. Both very cool caring people. They want to be successful with their business but just as important for them is social responsibility. Thor could have gone to any country in Europe to expand, but he chose Uganda, because he feels like that is the place in the world where he can make the biggest difference. He moved his family and opened up a store there, where the franchisee's start up payment will not be paid to Paradis A/S Denmark but will remain in Uganda which will support the local community. That is awesome! But back to the ice cream. How often do you rotate flavors? We have about 200 flavors. But we serve 16 a day. We rotate 2-3 of the each day. Sometimes more! Chocolate and pistachio are pretty popular, but people keep coming back for the low calorie fruit flavors like strawberry and mint/lime because they are low in fat and have fresh fruit. Are you looking to expand the store elsewhere in LA? It is our plan/dream to open several stores in southern California. We will open some and other interested people might open some, since it is a franchise. We would be more than happy to help others get started selling the BEST ice cream ever! Paradis is located at 2323 Honolulu Ave., Montrose, CA 91020 and is open from Sun-Thurs: 12pm-10pm and Fri-Sat: 12pm-11pm. Their flavors rotate every day, so follow them on Facebook to see which ones they're serving.